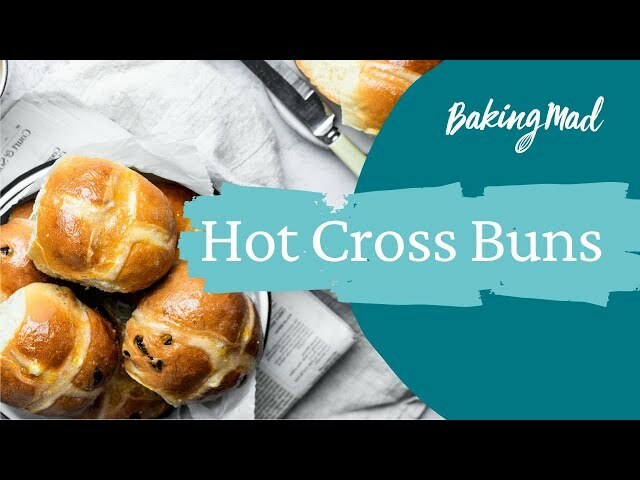 Bring joy to the whole family by baking your own Hot Cross Buns. Simply follow our six-step recipe using Allinson sweet dough. We like to bake a batch to share with friends, neighbours and colleagues (and admit to occasionally making these at other times of year, not just Easter, because they are so tasty). Bakers might also like to make our Chocolate and Pistachio Breakfast Wreath – sweet and beautiful. SHAPE Sift the mixed spice over the dough, then knead in with the sultanas and mixed peel. Cut the dough into 12 even pieces (use a weighing scales if you like). Roll each piece into a ball and arrange on a baking tray lined with baking parchment with space between for them to grow. PROVE Cover the dough again with a clean tea towel and leave to prove until almost doubled in size again. Preheat your oven to 200°C (180°C fan, gas mark 6). BAKE Mix the plain flour with a tbsp of water at a time to a thick paste and spoon into a piping bag (or into a plastic food bag and snip the corner off). Score a cross in the top of each bun with a small, sharp, floured knife and pipe crosses on the buns in the cuts you made. Bake the buns for 12-15 minutes or until golden. If you tap the base of a roll it should sound hollow. GLAZE Melt the jam in a small pan, then sieve out the lumps of fruit. Brush the apricot glaze over the freshly baked buns and then cool on a wire rack.